I had my first garage sale this morning. It was definitely an interesting experience, one that I will not repeat any time soon. Oh, it wasn’t that bad, I think I just went into the experience a little naïve. Most members would agree that women are not precluded from receiving or seeking any of the spiritual gifts outlined in Doctrine & Covenants Section 46, “And again, to some it is given to have faith to be healed, and to others it is given to heal.” This is not a gendered statement. Yet while it seems that Mormon women are not officially forbidden to heal, they are prohibited from engaging in the rituals of healing. The current Handbook states that, “only brethren who hold the necessary priesthood and are worthy may perform an ordinance or blessing or stand in the circle.” In this system, women become “hidden healers”; often the gift of healing that literally lies at their fingertips is unused, accidentally discovered and sometimes serves as the source of confusion or guilt. Not for the Faint of Fart! Are we in the middle of a council in heaven? The comments in a recent post at BCC reminded me of all of the unsubstantiated beliefs that float around this church regarding the afterlife. In the following series of posts I will talk about some of them. So Clark and I were discussing superheroes and Mormonism briefly the other day. He already put up a post on it (but in true super villain form failed to mention me – he shall hereafter be known as Dr. FailsToGiveProps). 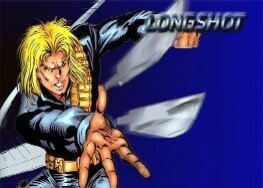 Anyway, I always thought the Mormon super power (if we had one) would be closest to the powers of an obscure former X-Man named Longshot.